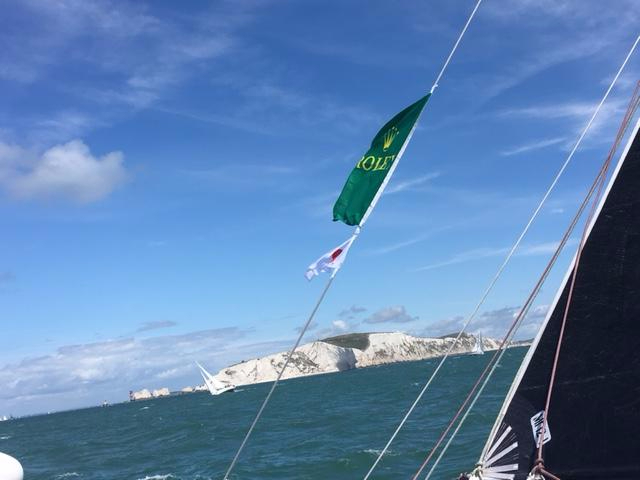 Welcome to the Rolex Fastnet competitors' blog. Messages from competitors will be displayed here. 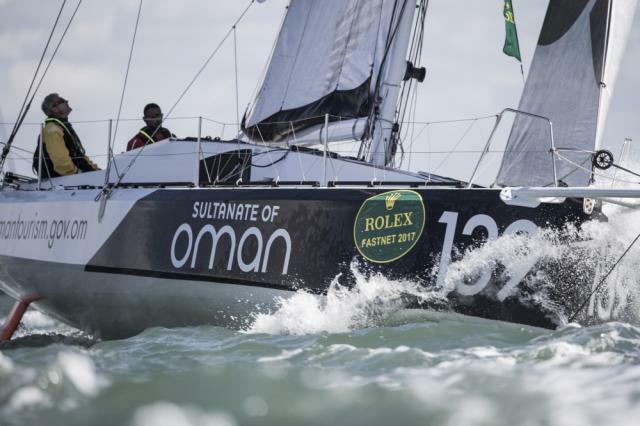 Any crew member can email text and pictures to the official RORC Rolex Fastnet web site. N.B. You must follow the instructions in the Notices to Competitors or the system will bounce the email back. You could create a template in your email system, to get this right every time. You can send pictures as attachments but only as JPG. MMS and web links will not be accepted. 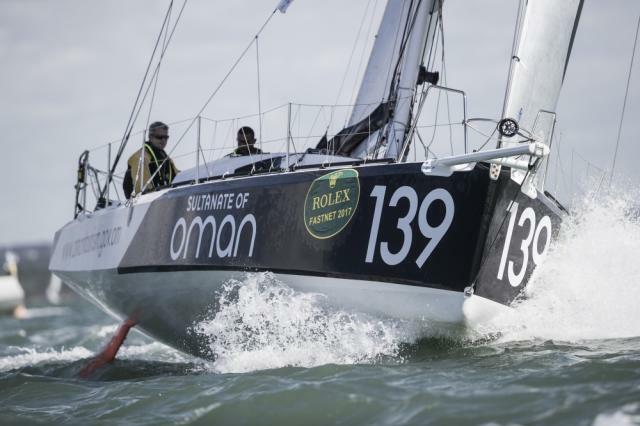 You should be in 3G Range for a good portion of the race, fair sailing! Tough Race... good fight against others. 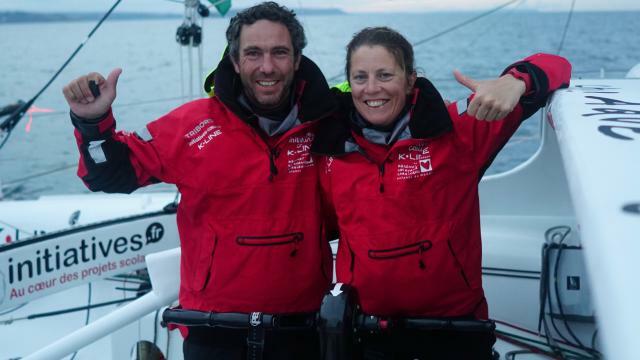 Congratulations to SMA Heading back to Lorient, need some rest. 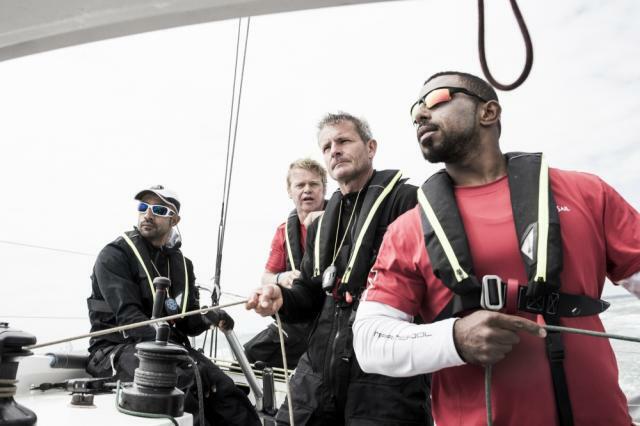 They have done it, Shabazz confirming Scaramouche are rounding the Fastnet Rock! > Another spanking 36 hours of sailing. 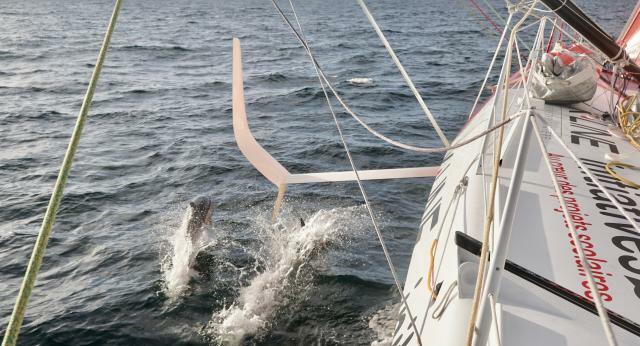 If it hadn't have been for it being 90% upwind we would have cracked open the champagne! > Having abandoned hope of any sensible weather forecasting (the grim and weather modelling fairies either being on holiday or on strike and any of them failing to agree) Barney and Skippy have resorted to more traditional 'methods'. 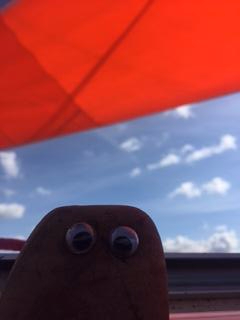 Skips has employed the services of his weather runes (random) and Barney has attached a piece of wet seaweed to the mast and keep muttering about albatrosses! However, somehow between them they have predicted that the wind will go North so a trip up the near side of the Lands End TSS was determined the way forward. Sunset at Lands End was stunning and the wind light enough to whisk us gracefully around the corner. A minor wobble by Adrian as we were lured by them sparkly sectored lights towards the rocks. > Nothing note worthy to report along the TSS and the slog across the Irish Sea has been relatively benign. The words 'high and fast' has become our mantra and we are all immune now to the utterances of 'encouragement' from the depths of the chart table. > As we settled into watches there has been muchos sleeping, muchos eating and muchos randomness of crew sanity. The James, much recharged after some well earned kip, has donned what can only be described as grandpa Jo long johns ... classy! Skippy is fetching in all in blue smurf! Adrian has gone slinky! Ain't no party like a boys thermals party! There has been singing galore and despite knowing none of the words to any of them we could produce a full double sided hum-alonga-song album. The only exception would be the entire crew can do a rousing rendition of Skippy's school song ... 'Wootonly House, Wootonly House, Wootonly House Hooray!My only other recalled comment of choice was 'you'd better retape the willy' .... I am as yet too afraid to investigate content or circumstances! 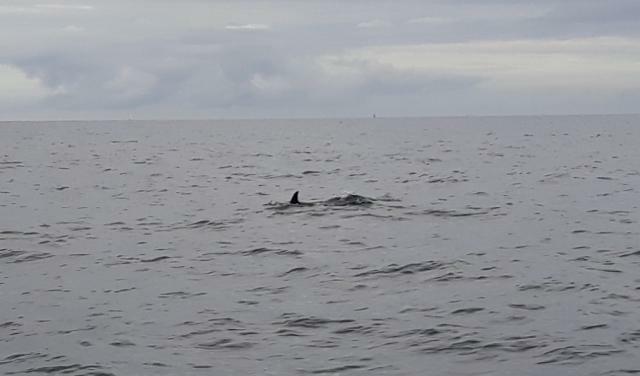 > We have been blessed with pod after pod of dolphins - just popping in to say hi before heading off on their merry way. 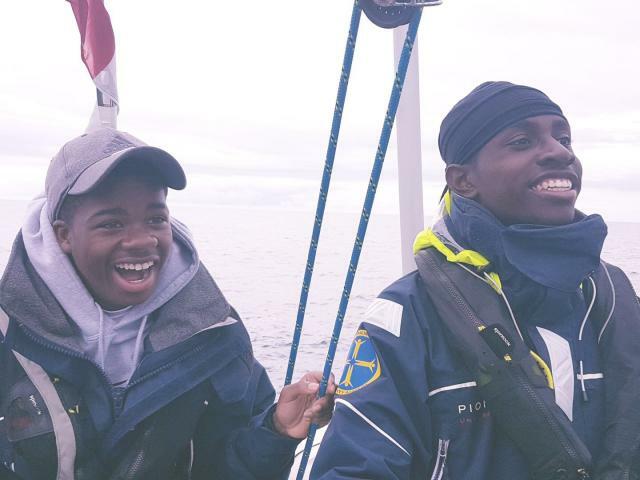 We definitely did see a basking shark - it's fin waving gracefully in the waves and James, dizzy with excitement, saw a whale - 'well perhaps more a bird ... it made a splash like an erupting whale'! > Fridge wars continue - it seems to have gone hormonal so there has been a push on 'using things up' and encouragement from the brains trust to eat eat eat! Dinner last night was described attractively as 'there's something that looks really horrible in a bag' but was another fine WA classic of pea curry. 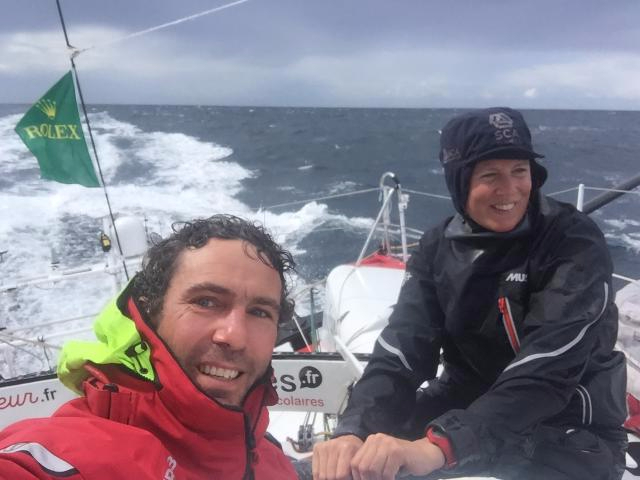 > As we approach the rock, we have just completed a frisky 8 hours of 20+knots in what can only be described as 'bouncy bouncy' seas. Fruity is an understatement but team WART have completed some of their finest, well choreographed sail change manoeuvres to date and although weary, a little bleary eyed, a little vomitty in places we are all feeling the love of this race, its challenges and everyone on our team of wave warriors. > 257 miles to go ... apparently post rock a full programme of Chubby Choules Charters activities begin ... watch this space! It is 6 in the morning at the time of writing. Before I went to my bunk, we changed the spinnaker wth Fahad and Alex. From big '180 m2 to medium 160 m2. 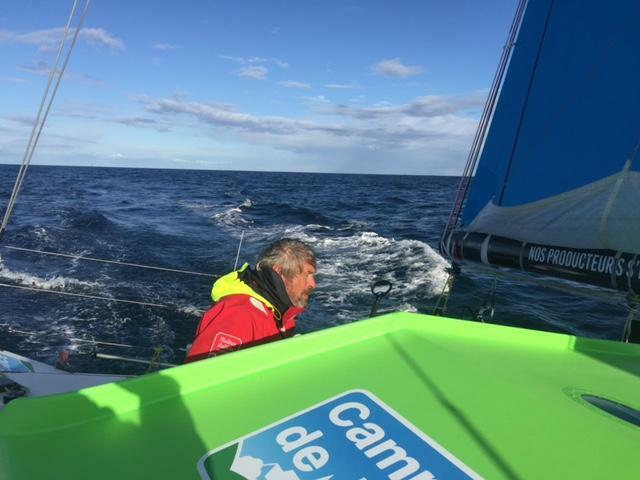 Now Alex is at the helm doing over 15 knots most of the time, often 20. Sami is sitting on a spinnaker bag, behind Alex. This is the first fast run for Sami… he is all right, even if resting is not easy. Everything is moved back in the boat, all the way back, near the rudders. We sleep on the floor, as far back as possible. 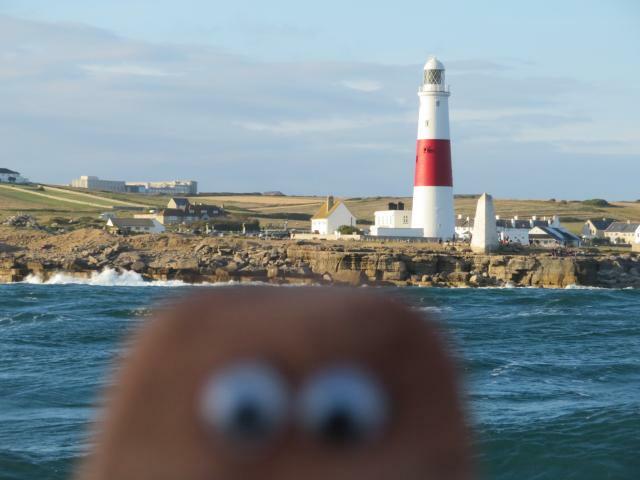 In less than 2 hours, we will be at the Scilly Islands, then we turn left for the last run to Plymouth. 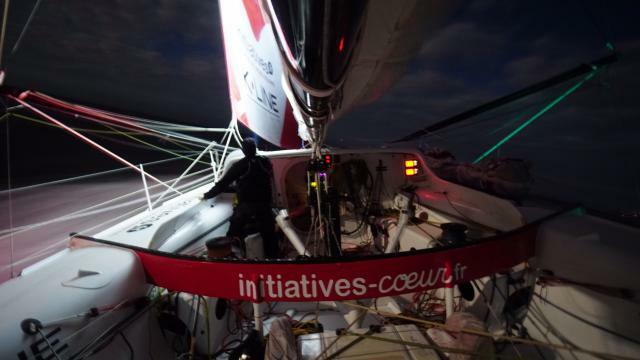 This one will be a wild run as we have to come up, closer to the wind, with more than 25 knots of wind. 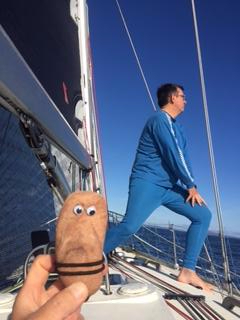 We will have to drop the spinnaker and use small sails (J2). 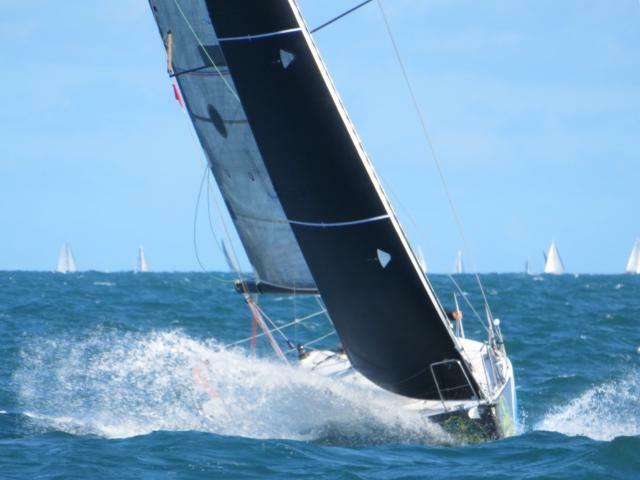 This boat has never been so fast, no doubt! 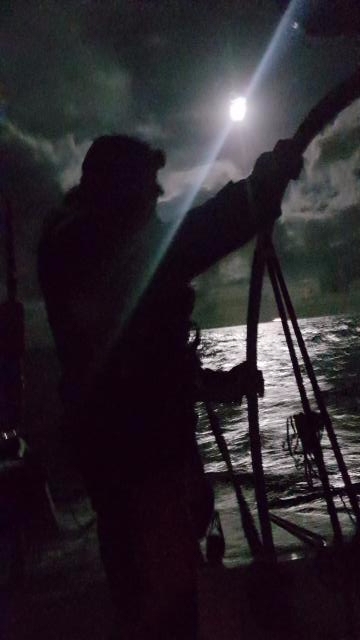 Conditions are ideal, full moon at night, stars, shooting stars, crossing the smaller boats going upwind....that's a good feeling! 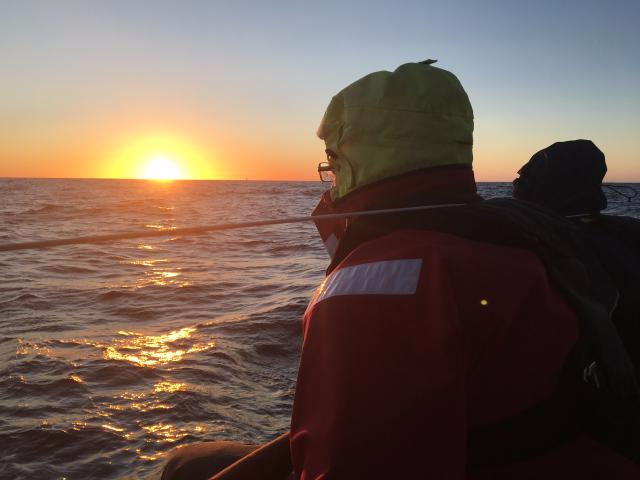 Wednesay's dawn was a welcome sight after the 120+ mile beat across a lumpy Irish Sea last night. 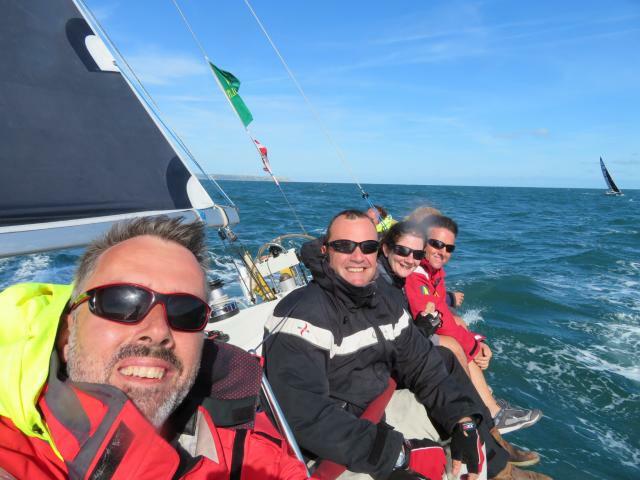 There was also some drama on the VHF with the 45' yacht 'Incisor' who lost most of their rig (mast and rigging) overboard and were escorted back to shore with their jury rig by one of the Irish lifeboats - happily all 13 of Incisor's crew are fine, but their race is over. Our night was also a busy one - Jib change from #1 to #2, reef in the main, reverse and repeat! With the Irish coastline now coming into view its all worth it 😀. 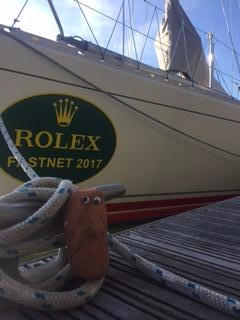 Next waypoint is 'The Rock' which we should reach in a couple of hours or so, then it's (nearly) all downhill from there to home! Scaramouche is currently out of phone signal, so hopefully you receive this. For your information, I have heard that Scaramouche should be on ITV London tonight, I believe the news is at 1800, however they may not feature until 1820. I will try and get the links to you as soon as I can afterwards. As soon as I have any more updates from on board I will send these your way. Thank you for sharing their story so far. 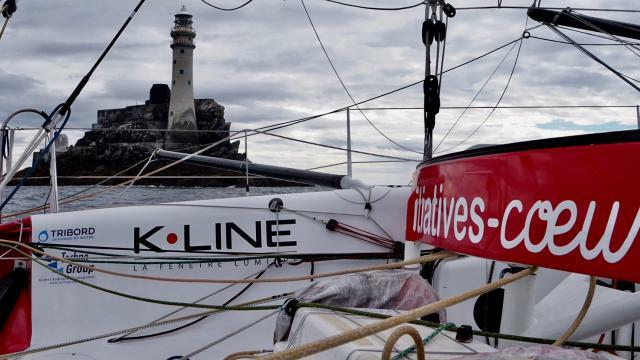 We are 8 hours from the Fastnet rock, heading upwind. 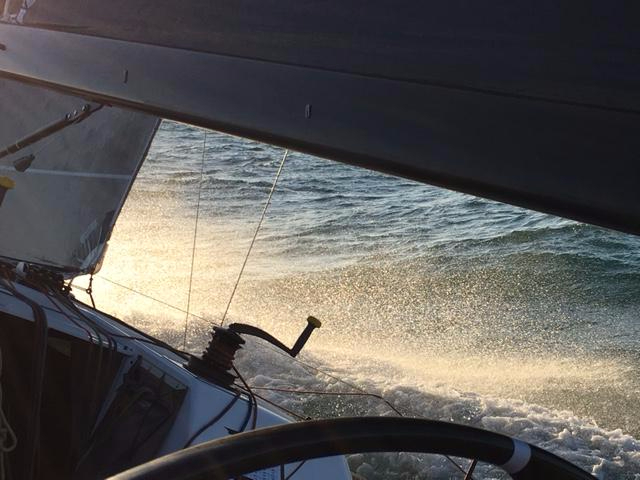 Conditions are ok, of course upwind is never very comfortable, but the sea state and windspeed are ok. 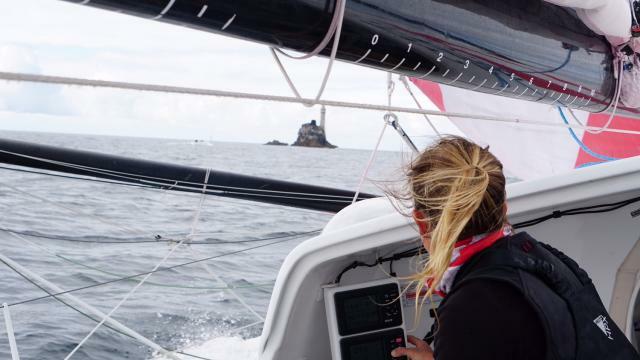 The wind direction is changing quite significantly, so it is important to choose the right route so you arrive at the mark rounding on the good windshift, you can make a significant gain on the others if you get it right. I am trying to get the latest weather info as they are quite accurate, and the latest one is always more precise than the previous one. Yesterday evening, Sami came to me and said very quietly: "Sid, I think we have no more gas...". Well, I hope this will be a good experience to not forget again such an important detail. As you know, we eat exclusively dry food that needs to be rehydrated with boiling water. Alex has managed to rehydrate some noodles, during 2 hours and leaving the box in the engine compartment to warm it a bit. We need to be creative in these kind of situations. 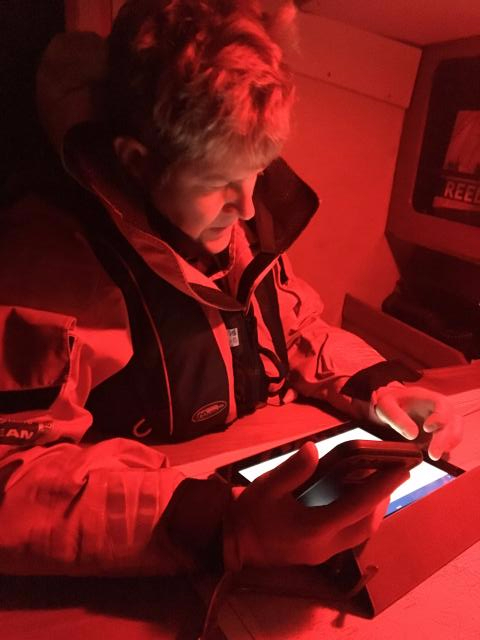 It is difficult to catch the boats in front, the boat speeds are very similar, and we are lacking a lit bit of extra gear in these conditions. 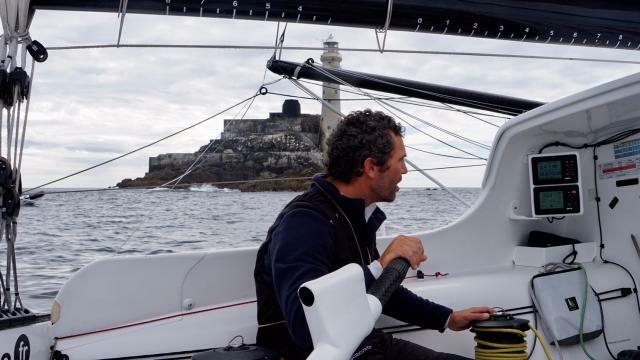 Rounding the Fastnet rock, each boat will extend the distance on the chasing boat as we go from slow upwind to fast downwind. But we still have 24 hours racing and a lot can happen. All right, the adventure goes on, talk soon. Well ... it' been an eventful first 24 hours. 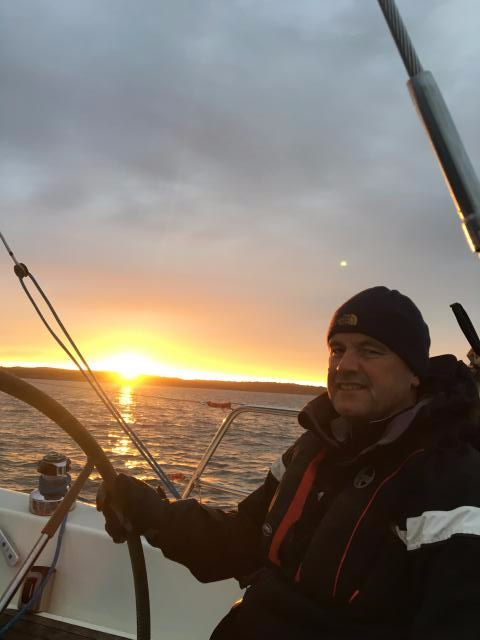 Currently bobbing off the Lizard in 7knts enjoying wees and tees on the horizontal rather than our more recent balancing elephant on wet ice at 30 degree effect ... the heads are almost a pleasant place to be! 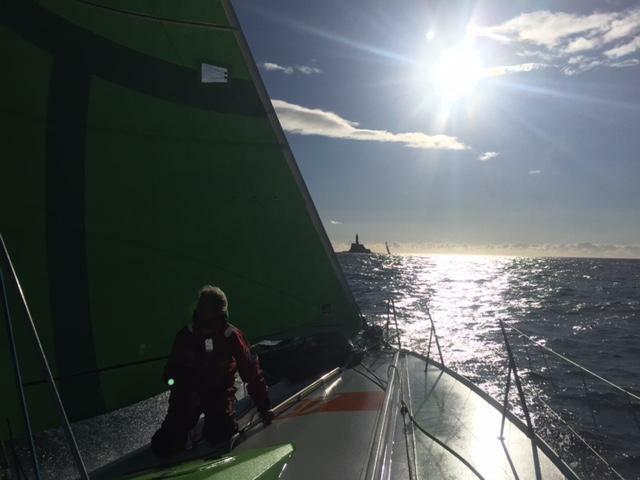 In true Fastnet fashion the first few legs have been 'robust'. 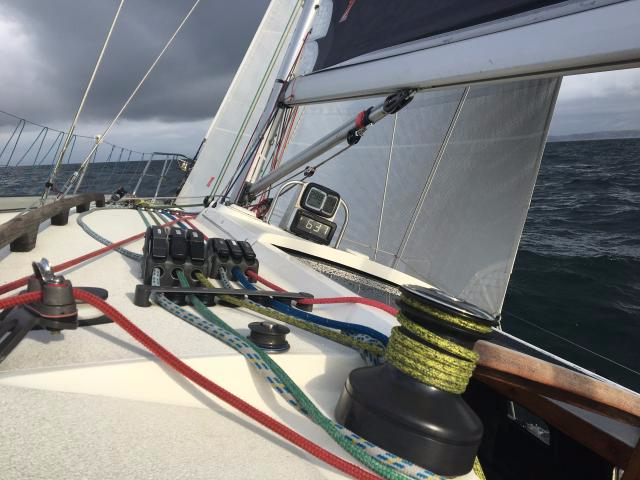 A friendly 15-21knots of breeze have kept us on our toes and at a jaunty angle. We chose the mid-channel tidal rollercoaster out of the Solent with time to brush the shore of Hurst Narrows to wave at the assembled throng of spectators. 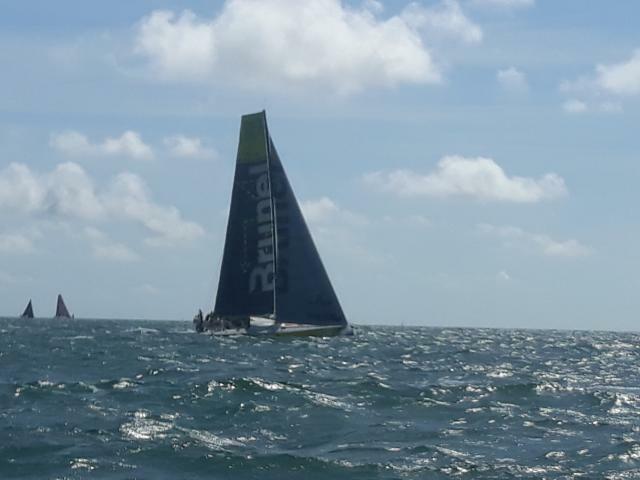 With the rest of the fleet we opted for 'out' rather than 'in' across Poole bay. 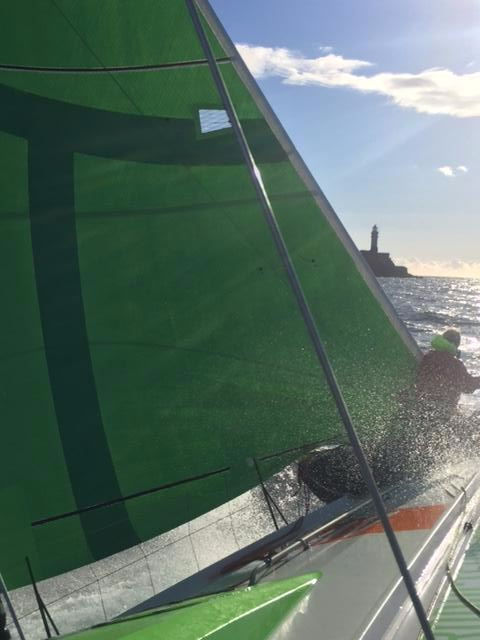 We rolled the dice at Portland and while the rest of the fleet headed offshore (presumably) in anticipation of the southerly wind shift, we inspected the coves, beaches and rock formations in flat water conditions at the end of the Bill. Our only obstacle were 2 fast fleet boats hindering our final tack in out of the overfalls and we ended up slogging the tide for a short while before being spat out to continue our passage across towards Start Point. 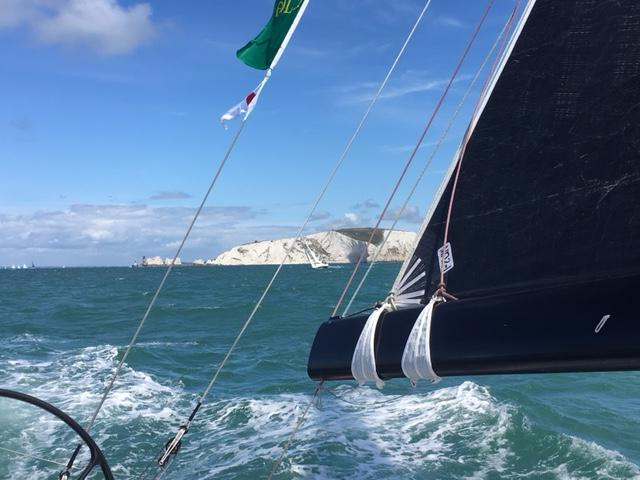 Lyme Bay was a dream - fat and fast, nailing the lay-line but having the rocks or tide debate at the headland. The last few hours have been a tad frustrating. Wind has been up and down and down and up. 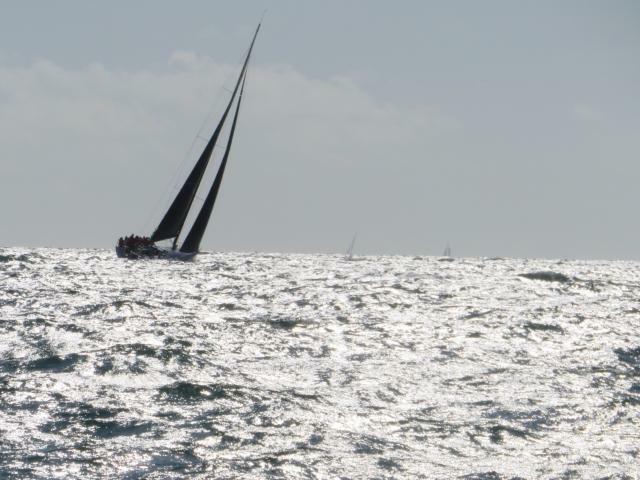 The Lizard is within tantalising range but we are bobbing in 5kts of puff awaiting a change in the breeze. WART morale is good. Minor hiccough at the start when we realised we were missing the essential lunchtime dill ... things hit an all thyme middle-class low but spirits have since been roused with homemade ginger cake. The fridge is on the wonk and we have had to dispense with the services of the ice-creams but we are carrying plenty to ward off scurvy! If we get really desperate there are enough artificial colours and preservatives in the shed load of pot-noodles and vile cake of angelness we are carrying as emergency spares ... let's hope we don't reach that threshold. The dolphins have just arrived (only slightly later than booked) and are currently mating the rudder! Skippy is making alarming bonding noises but we hope this will pass or 2IC will step in and we will have to confine him to the lazarette. Ness - much loved and incredibly tolerant of us all ... especially Skippy, his many random questions and his wet pants! 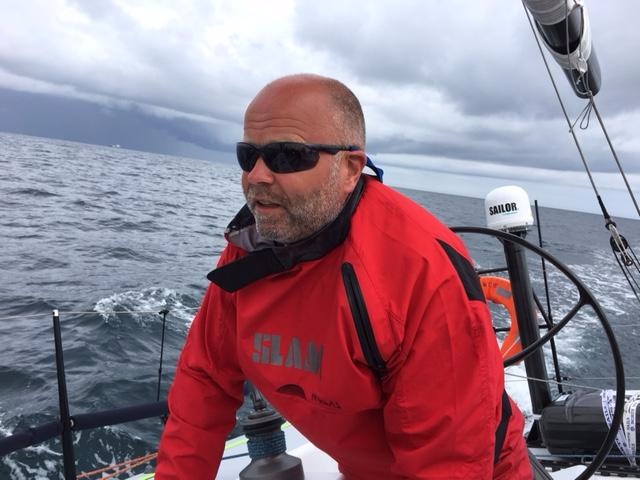 From the skipper: "Tasty hot curry for lunch, Pete Weller welded to the tiller"
along side the VO65 of team Brunel. given to going south of the cascutes TSS. A few more video clips from 'With Alacrity' attached. far from Espoir Mazambi attached.